(a) Check the DTCs (Current trouble codes). (1) Turn the ignition switch to ON, and wait for approximately 60 seconds. (2) Using SST, connect terminals TC and CG of the DLC3. Connect the terminals to the correct positions to avoid a malfunction. (b) Check the DTCs (History trouble codes). (1) Using SST, connect terminals TC and CG of the DLC3. (2) Turn the ignition switch to ON, and wait for approximately 60 seconds. (1) Read the blinking patterns of the DTCs. 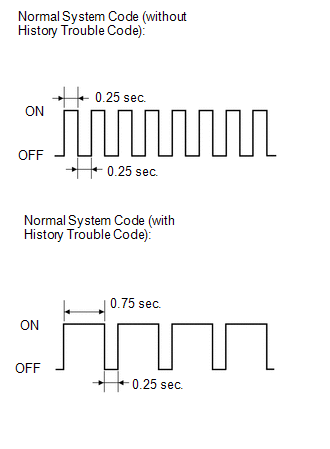 As examples, the blinking patterns for the normal system code and trouble codes 11 and 31 are shown in the illustration. The light blinks twice per second. When the history trouble code is stored in the center airbag sensor assembly, the light blinks only once per second. The first blinks indicate the first DTC. The second blinks occur after a 1.5-second pause. 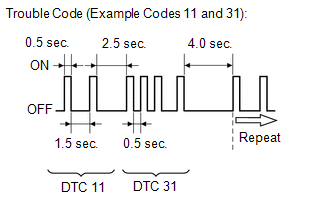 When a DTC includes a letter (such as DTC 8A), the light blinks 8 times and then it blinks 10 times to indicate the A after a 1.5-second pause. If there is more than 1 code, there will be a 2.5-second pause between each code. After all codes are shown, there will be a 4.0-second pause, and then all codes will be repeated. If 2 or more malfunctions are found, the indication begins with the smaller-numbered code. 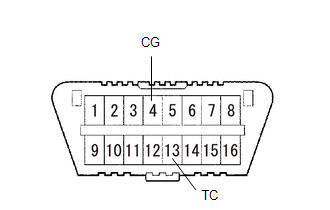 If DTCs are indicated without connecting the terminals, proceed to TC and CG Terminal Circuit (See page ). (1) When the ignition switch is turned off, the DTCs are cleared. Depending on the DTC, the code may not be cleared by turning off the ignition switch. In this case, proceed to the next procedure. (2) Using SST, connect terminals TC and CG of the DLC3, and then turn the ignition switch to ON. 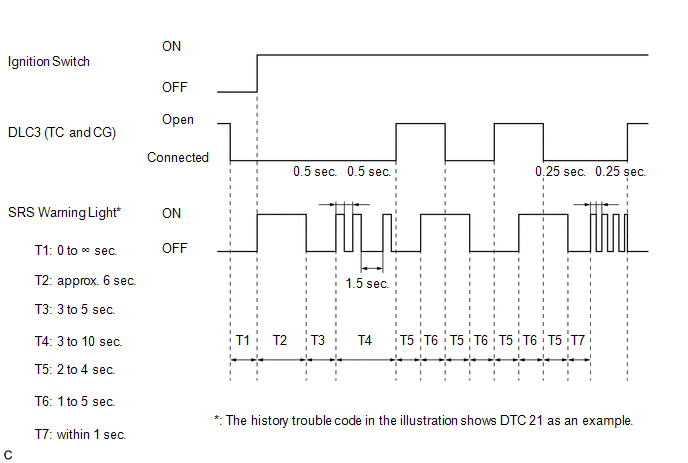 (3) Disconnect terminal TC of the DLC3 within 3 to 10 seconds after the DTCs are output, and check if the SRS warning light comes on after 3 seconds. (4) Within 2 to 4 seconds after the SRS warning light comes on, connect terminals TC and CG of the DLC3. (5) The SRS warning light should go off within 2 to 4 seconds after connecting terminals TC and CG of the DLC3. Then, disconnect terminal TC within 2 to 4 seconds after the SRS warning light goes off. (6) The SRS warning light comes on again within 2 to 4 seconds after disconnecting terminal TC. Then, reconnect terminals TC and CG within 2 to 4 seconds after the SRS warning light comes on. (7) Check if the SRS warning light goes off within 2 to 4 seconds after connecting terminals TC and CG of the DLC3. Also check if the normal system code is output within 1 second after the SRS warning light goes off. If DTCs are not cleared, repeat this procedure until the codes are cleared. (e) Enter the following menus: Body Electrical / SRS Airbag / Trouble Codes. (f) Check the DTCs by following the prompts on the Techstream screen. (f) Clear the DTCs by following the prompts on the Techstream screen.